The Vermont Vue, made by Victory Leisure Homes, is new for 2014 and we looked at the 36ft x 12ft 6ins size with two bedrooms. The exterior is eye-catching with a cream finish, but the window frames are driftwood in colour, a distinguishing feature. The living area has a French door and windows across the front aspect with a wrap around sofa against three walls. This converts to a sofa bed for occasional use and is a standard fitting, rather than an option. An electric log effect fire sits in a cream coloured traditional looking hearth, with a mirror above it. To the right is a television table with dedicated TV sockets and to the left is a storage unit with shelves and a cupboard. There are recessed display shelves with down lighters in the wall at the back of the sofa. 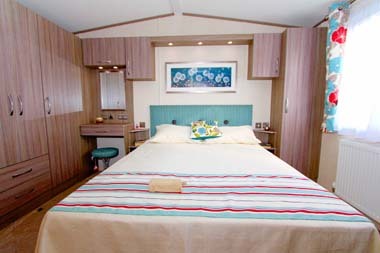 The curtains are duck egg blue and silver in wide horizontal stripes and coordinate with the driftwood colour furniture. A simple dining area has a table and four ladder back chairs. A room divider separates the lounge from the U shaped kitchen which makes the most of the full width of the static with the central heating boiler and the integral fridge freezer set behind the dining area. A high level microwave, an electric oven and grill, four burner gas hob, extractor fan, one and half bowl sink unit are standard fit appliances. The cupboard colour is ivory. A partially glazed door leads into the hall. The master bedroom has a king size bed with a duck egg blue padded head board which, unusually, disappointed us as it lacked the boldness and flair which has become synonymous with this company’s interior design package. There’s generous space in the wardrobes and a mains socket and television aerial point in a fixed wall unit. The en-suite has just a lavatory and one of the tiniest pedestal hand basins that we’ve seen. The second bedroom has twin beds and the same style headboard as seen in the main bedroom. Storage space, given it’s a guest room, is good. 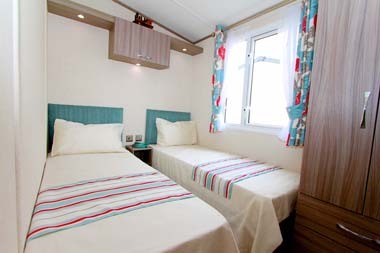 Built to EN1647 standard for temporary holiday use, this static caravan is not designed for residential purposes. Please refer to the park licence and associated planning conditions when determining the standard you want. 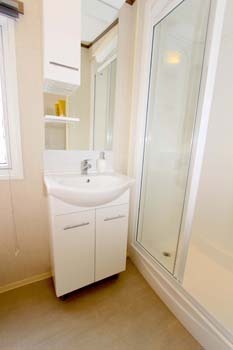 The shower room is functional with a large rectangular shower with a couple of tall, narrow recesses for toiletries. A corner has been put to good use with the installation of the toilet and the semi-recessed hand basin is set on a glossy white cupboard with another cupboard and mirror above it. There is a heated towel rail, but towel rails are in short supply. 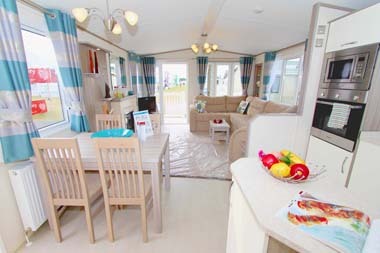 Verdict: The Victory Vermont Vue may not have the same bold and vibrant colour scheme that we associate with the lovely lady interior designer at Victory Leisure Homes but it does have some appeal and it is good value for money. An extra six inches (15cms) width has created more space which is particularly noticeable in the second bedroom. 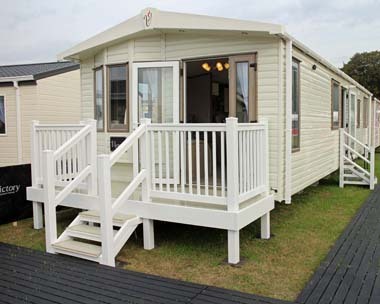 Are there any less common claims that could potentially affect my static caravan or park home? 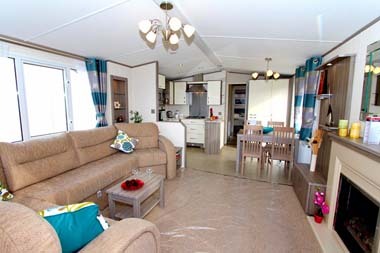 I am waiting for this particular caravan to come into our caravan park, and Im excited to see it, may, buy it. 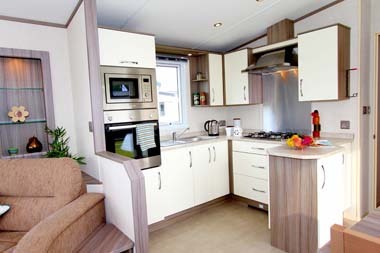 We at pesent have a bottom of range caravan, but its basic and warm. The only worry we have with the Vermont vue is, that it doesnt have extra insulation, as its standard, like the lower end models, and we dont know if the ceiling vents will, let the cold air come into the caravan, if anyone out there has one of this models, pleas mesg me on facebook, on my name Teresa Lloyd, nd let me know how u find it, Lloyd is my maiden name. Many thanks for getting in touch. Hopefully someone will be able to help on Facebook or here on the blog. In the meantime, I’ve put your query to Victory to see if they have further details. If your inquiry relates to the BS3632 level of specification, then there are Victory models that can be supplied. I hope this helps. Let me know if you need further information. It’s not something we could advise on. The price you pay is all dependent on which site you are buying on. As for the flooring, it’s hard to say as there are probably different options. If you want to check it out, you could try asking Victory. Please click here for Victory contact details.